Our transportation fleet consists of modern, specialist car transporter vehicles that are driven by highly-experienced delivery drivers who carry out car and vehicle transport services nationwide. 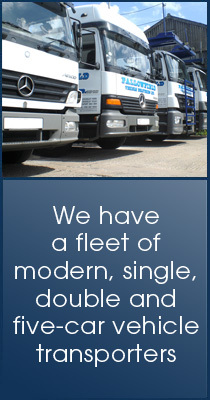 We have single, double and five-car vehicle transporters that are available nationwide. We also have covered car transporters for VIP deliveries and high value cars. Our vehicles are all LEZ (Low Emission Zone) compliant and we adhere to all safety standards imposed by VOSA (Vehicle and Operator Services Agency). We have been members of the F.T.A. (Freight transport association) for 18 years. We work closely with the F.T.A and have taken advantage of the opportunities they offer regarding driver training courses. Our drivers have attended up to date training courses and seminars with regards to driver responsibilities and health and safety. Our company is committed to providing the highest quality of services to the automotive industry. We hold service agreements with major leasing companies and are currently working alongside numerous car dealerships within the corporate and retail sector. Our portfolio consists of Mercedes Benz, Jaguar, Audi, Vw, Bmw, Nissan and many more. Our Drivers wear corporate uniform with I.D cards and have been professionally trained within the industry and are fully compliant in full vehicle handover procedures, timed deliveries and all aspects of leasing paper work. Our aim is ensure the customer has a high quality / satisfactory delivery experience. We understand the urgency of returning all signed delivery documents with any used car appraisals.These are dealt with in a timely manner and are returned to the dealership as a matter of urgency. To meet and adhere to new leasing company legislation. Fallowfield now offers a leaseplan MoDel p.o.d. service. We also offer a national or local facility for the collection of new, un-registered cars or Dealer transfers which is particularly recommended for vehicles where a minimum delivery mileage is required. Or company is covered by a full comprehensive motor trade insurance policy with QBE. This offers us the flexibility within our business and ensures peace of mind that all vehicles in our possession are safe and secure.